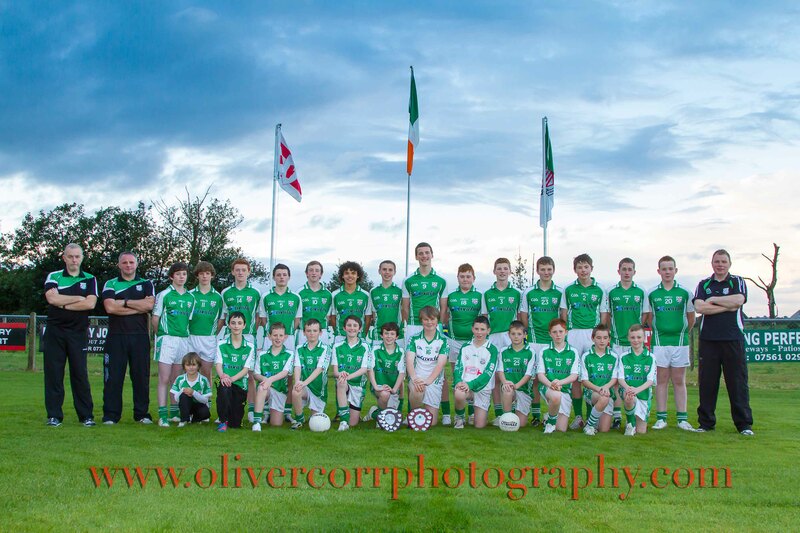 This is Derrylaughan Under 14 team who won both the league and championship this year. Derrylaughan Kevin Barrys is a Gaelic Athletic Association club based along the Washing Bay area east of the parish of Clonoe in County Tyrone. Previous clubs existed in 1903 (‘Rising Sons of Goff’), 1917–19 and 1923 (Aughamullan Erin’s Hope/Pearses and Kevin Barrys). Washingbay Shamrocks flourished in period 1929-36 and 1939–48; won junior league in 1929, Dr. Collins Cup in 1932, SFC in 1934 (finalists in 1931), JFC in 1942. The club as it is presently constituted was formed in 1945, and named after Kevin Barry. The club saw success winning the Junior Football Championship in 1949. The club won a Tyrone Senior Football Championship title in 1967, having been finalists in 1957, 1962, 1964, 1965 and 1966. Captain on this occasion was Mena Devlin. Indeed Devlin managed the team to another SFC success in 1981, Gerry Taggart captaining the team. Incidentally both SFC wins came following victory over Carrickmore Saint Colmcille’s. Many of the 1981 team had featured on the Minor Football Championship winning team of 1977. More recently the club has endured a protracted spell in Intermediate Football, however it did win the Division 2 Football League in 2003. The club has worked to update its facilities through the years. It opened new playing fields in 1981 and dressing-rooms in 1984. Redevelopment work in the late 1990s saw the clubhouse upgraded. A second pitch was opened in 2004. The grounds vested in GAA. Derrylaughan regained their senior status winning the 2010 Tyrone Intermediate Championship following victory over Urney.